In what locals will know as Albert Square is what has temporarily been re-named as Festival Square. Inside you’ll find a Theatre (known throughout the festival as the Pavillion Theatre), a large marquee housing a very nice bar, more than one place to eat, the festival’s ticket office, and a covered stage. For most of the day, there are musicians and artists on stage, and the Square is packed with people the entire time. The theatre is like those magical tents from Harry Potter and the Goblet of Fire and the Quidditch World Cup; things look ordinary from the outside, but inside is another story altogether – much larger than it seems, and impressively equipped with a bar, and air conditioning. There’s been some hype surrounding Stealing Sheep – some of it even provided by myself, actually – so the crowd is at first a little disappointing. The band arrive on stage, all wearing silver lamé unitards and sunglasses, and the drummer doesn’t sit behind a massive kit; it’s a nice, refreshing change. What is disappointing about them – and something I have never noticed up until now – is that they’re doing that super-trendy-but-bizarre thing of singing from their throats. The crowd are mostly very still, although there are a few people giving dancing a try. Stealing Sheep live kind of reminds me of a slightly more mature Shampoo. The sunglasses are removed in sync, of course. Pips and boops from the laptop and dancers appear in brightly coloured unitards, and now the stage looks completely cramped. Vocals are mostly provided by the keyboardist, and they’re reminiscent of Stina Nordenstam or Robyn, perhaps. Gradually, the audience has shifted forwards but still very few people are actually dancing. A wise man and fellow writer once told me that the crowd are a great indicator of whether or not a band is good live. Sure, sometimes the crowd don’t quite ‘get it’, but on the whole, the advice rings true. The dancers reappear, this time in blacks, and carrying neon images drawn on what looks like cardboard, while blue boxes flash on and off on stage to a frenetic rhythm and an upbeat, cheery melody coupled with high-speed vocals and lyrics about feelings. It’s good, but if they dropped the gimmicks, it’d be less distracting. At least a larger chunk of the crowd is dancing now, albeit somewhat reserved. It sounds exactly like it does on record, though. For some, that’s enough; for some people, that’s what they want – for it to be reproduced exactly. In that case, then, simply pop on a CD or Spotify or whatever, grab a fistful of glow-sticks and host your own gig in your own house in your pyjamas, the effect would be the same. Bonus if you tuned out the lights. For others though, it needs that something more; a chance to do something a little different with a slightly different vibe, for example. Actually, I think I’ve figured them out. The gimmicks and the dancing is an attempt to inject ‘something’ into their performances since – besides the music – they have very little to offer. They don’t need to play live, really. A DJ could do the job, and probably with their eyes closed. It’s really good, but it’s not much else; radio-friendly electro-pop. And by radio-friendly, I mean Radio 1 and Radio X (possibly). This is essentially a performance for hipsters. Musically, I’d go as far as to say it’s bloody brilliant. Live, however, it’s a bit boring. While some of the audience are trying to dance along, the vast majority aren’t. Either they’re not into it, or they’re outright refusing to – and I don’t know which it is. I don’t suppose it really matters. It’s almost like they’re trying to outdo Lady Gaga, Sia and Bjork at the same time, but they fail at all of them simultaneously. I can, however, given the above references to Bjork, Gaga, and Sia, see why Stealing Sheep are becoming so popular with the youth. I can also appreciate what the band are trying to do – but perhaps they should at least consider scaling it back to what’s really important. The encore sees a minor costume change in the form of the silver foil/streamers worn by the dancers previously. 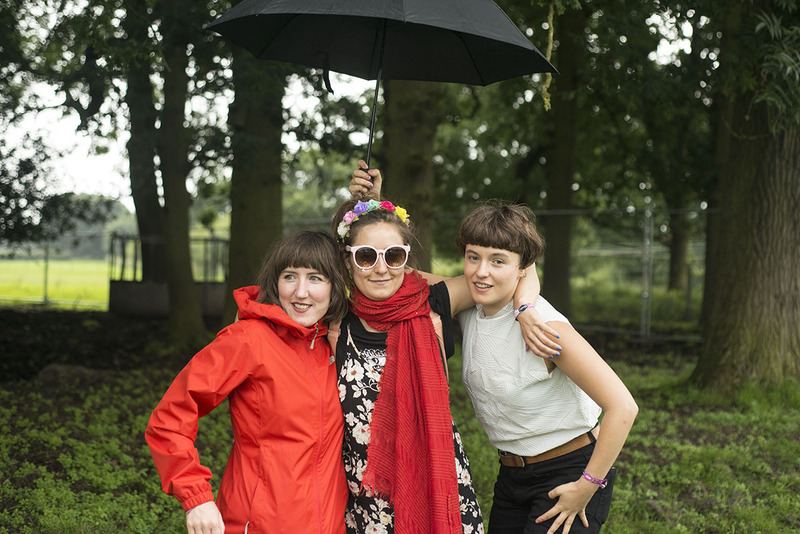 Musically, Stealing Sheep are faultless, but it could (and should) be incredible. It falls far too short of this, which is a real pity. They don’t even need their instruments – they could put it all on a computer – and then focus on the dancing and theatre of it instead. Respect to them for trying to do it all, but I just don’t feel as though it’s working as well as it could. The encore track contains the words “It’s real/so real.” I’m not sure it is, but I guess the point is that they believe it. Artistic critique is necessary in a world of people who blow smoke up eachother’s backsides far too often, but quite a lot of what you’ve written here is plain nonsense. I agree with Steve on this, Toni. You seem ill-informed. As for the line about the band ‘becoming popular with the youth’… Jeez. If it’s meant to sound wryly ironic, it really doesn’t come through, it just sounds like the painful moment a mid-90s Tony Blair asks Damon Albarn ‘so, what’s the scene like at the moment?’. Vocals described as like ‘Stina Nordenstam or Robyn’… two singers with tremendously different voices. With the former being one of my all-time favourites, and having seen Stealing Sheep three times, I can confirm that no member of the band sounds like a small Scandinavian woman-child being glacially depressed somewhere on an actual glacier.